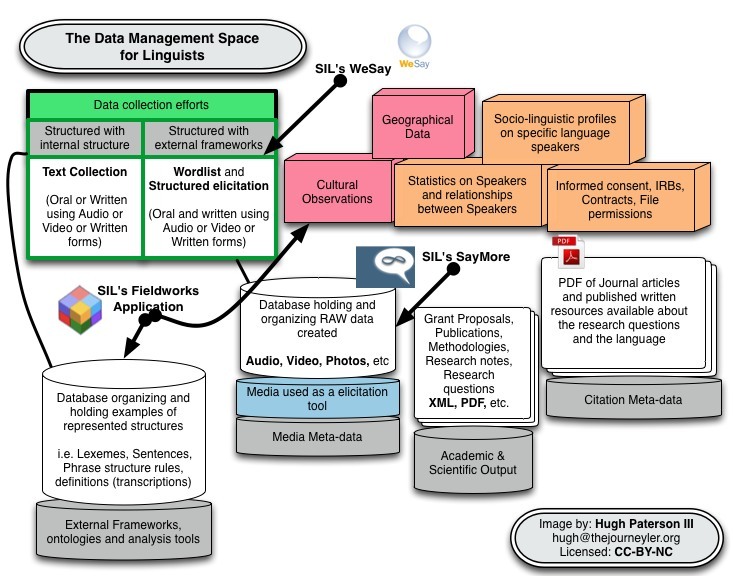 This entry was posted in Cartography, Citations, Language Documentation, Lexicography, Linguistics, Meta-data, SIL International and tagged Data Management, FLEx, Linguistics, SayMore, WeSay by Hugh Paterson III. Bookmark the permalink. If there are any glaring omissions then please speak up. 3. Finances: Tracking finances for income or expenditures for the projects. 4. Publicity: interactive features and web presence for the project. 5. Computer Network set up and tools list for the project. Like I said these are not quite Linguistic data issues but they are data sets which need to be managed.